Most golfers try to influence the left or right flight of the ball by adjusting their stance and/or grip. We will address the stance in this section. Have you ever stood for a draw and actually sliced the ball worse than ever? If you move the right foot back, (assuming a right handed swing) but leave your hips open, you will fade or slice the ball regardless of your draw stance. 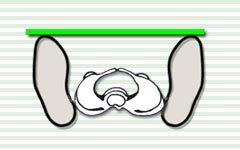 (mouseover here) It is the placement of the hips that dictates the closedness or openness of the “swing”, not the placement of the feet. 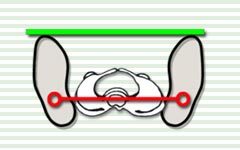 When adjusting your stance for a draw/fade, it is important to first align the feet, then the hips. 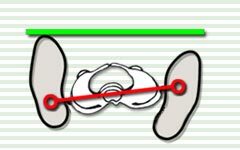 Slight hip and foot position changes (1 to 3 inches) have far greater effect on the flight of the ball than exaggerated ones. 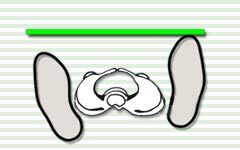 While the foot placement in the previous example is correct, the draw or fade does not occur without the correct placement of the hips also. So, why so much focus on the hips? 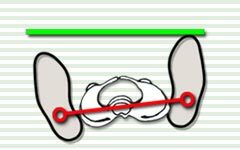 Since, they are connected to the spine, any placement, tilt or movement of the hips has a direct effect on the rotation of the spine, which in turn dictates the inside/out or outside/in plane of the swing. How to adjust your stance to draw or fade the ball. Square: Straight shot Both feet in line with target line. Open : Fade shot (left to right) Left foot lower than target line. 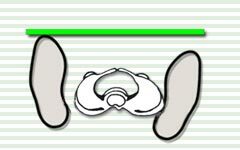 Closed: Draw shot (right to left) Right foot lower than target line. A HOOK STANCE WITH AN OPEN HIP WILL SLICE!